Do they not know the iPhone 4S isn't out yet? The Apple Store in Covent Garden, London, was robbed in the early hours of Monday, with masked raiders on bikes targeting the outlet. Scotland Yard has confirmed that two people have been arrested after the incident – a16-year-old and 21-year-old male. A number of bags that are said to belong to the robbers have also been found, with their bounty including - unsurprisingly - a number of iPads. Speaking about the incident, Detective Sergeant Nathan Tozer of Westminster CID told the Guardian: "Although two men are in custody on suspicion of burglary, the inquiry continues and other persons are sought. "It is essential that anyone who saw the smash and grab, or the suspects making off, contact us as soon as possible." 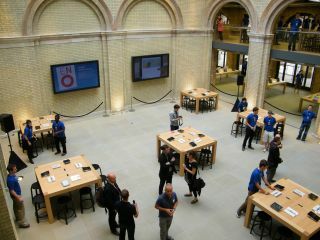 The Apple Store in Covent Garden opened its doors back in August 2010, with Apple announcing that it was "the best store we have ever created".